There are programs out there that gave Internet optimizers a bad name. TweakMASTER is different. It works perfectly in any Windows version from XP to Windows 10 and has a slew of methods to squeeze that last drop of possible network performance. TweakMASTER will substantially improve your web surfing and download speeds. It works for all types of connections: dial-up, DSL, Cable or Wireless. Even AOL users will be amazed with the improvement TweakMASTER provides. TweakMASTER LinkFox is the first truly discriminating web accelerator for Internet Explorer. It will intelligently load only the links you want to look at, so they will load instantly the moment you are ready to view them. LinkFox is a great timesaver for any serious web surfer. This function is available only in the Professional version of TweakMASTER. TweakMASTER includes the first truly intelligently designed DNS caching facility which helps you to connect faster to the sites you visit most often. The DNS Accelerator is fully automatic once enabled and will speed up your web experience with no further attention on your part. The Connection Throughput Test can be used to accurately measure the throughput of your Internet connection, to decide which optimization strategy works best for you. TweakMASTER allows you to perform regularly scheduled updates to your computer’s clock from accurate time servers on the Internet. You can schedule these updates daily or weekly if you like. 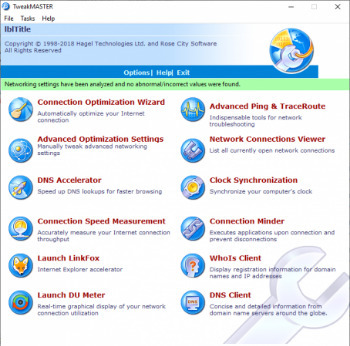 Advanced Ping and Traceroute is an enhanced version of popular utilities for troubleshooting network connectivity problems, traffic congestion, and other related problems. TweakMASTER’s integrated implementation offers a “swiss army knife” for network troubleshooting, and enhances the traditional implementation is many ways. Network Connections Viewer is a tool which lets you see all currently established TCP connections, and see on which TCP and UDP ports your computer “listens” for incoming connections. WhoIs is a searchable database maintained by network registrars that contains information about domain names, IP addresses, networks, networking organizations, and the contacts associated with them. The Domain Name System (DNS) is a hierarchical naming system for computers, services, or any resource participating in the Internet. It serves as the “phone book” for the Internet by translating human-friendly computer into numeric (binary) IP addresses. TweakMASTER is able to execute user-specified programs upon detection of an active Internet connection. This feature is useful when you don’t want programs to be started on Windows startup, yet want them to be available when you connect to the Internet. Instant messaging (MSN, ICQ), VoIP (Skype, etc.) and other software fall into this category. If you don’t have an “always-on” Internet connection, you will appreciate this function.